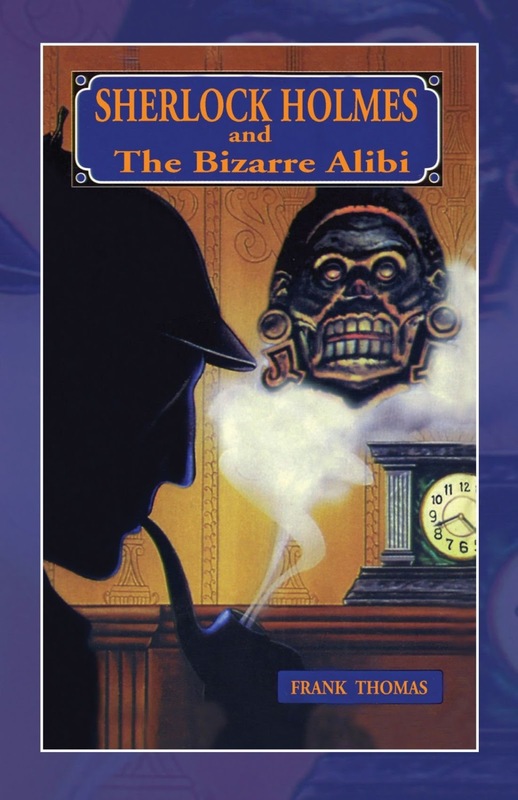 Frank Thomas was the author of some 10 Holmes novels, starting with Sherlock Holmes and the Golden Bird in 1979. His later books were self-published, including this 2004 release. With only the light of Slim's bull's-eye, it was rough going and soon my hands were bleeding and my legs protesting . But an untapped source of strength came to my aid. Here I was struggling towards unknown dangers, but i was living, i was part of an adventure. I was in the midst of an experience that my sedate fellow doctors in their well-appointed offices on Harley could only find in flights of fantasy. I was actually part of the stuff tha dreams are made of and, somewhat to my suprise, i found it exhilarating. Because of my association with the greatest detective the world has ever known, I was part of an heroic saga, a small part I will admit. Not that I felt heroic. I felt like a middle-aged commonplace man involved in exploits he was ill-suited for. But I was here with Holmes and I would not have had it any other way.